parade before the big division of Summer appears." 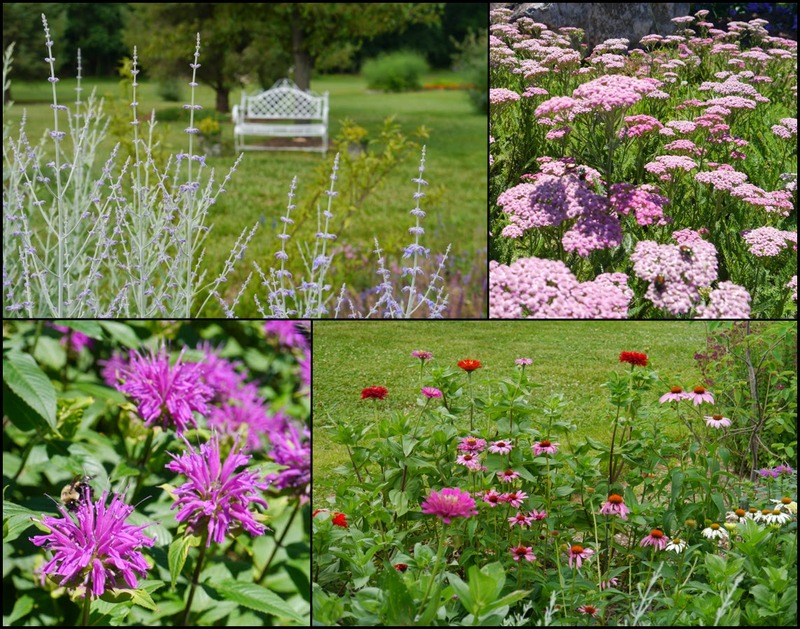 There may still be a little truth in the quote above from Mr. Wright's 1929 publication, but today we are fortunate to have an endless variety of flowers to beautify our gardens throughout the summer. 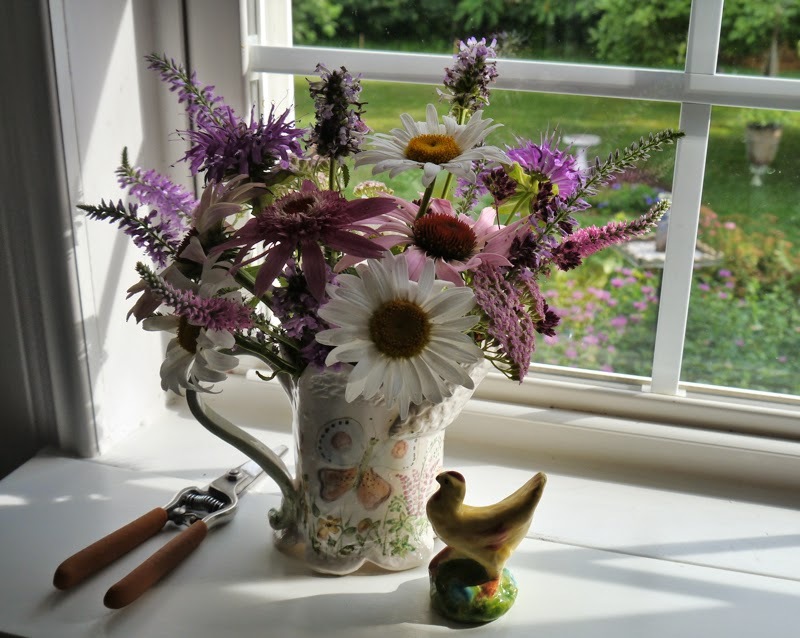 Today I'm going to share with you some of my favorites - both annuals and perennials - all of which are great for cutting to bring indoors where they can be enjoyed in the comfort of your home. 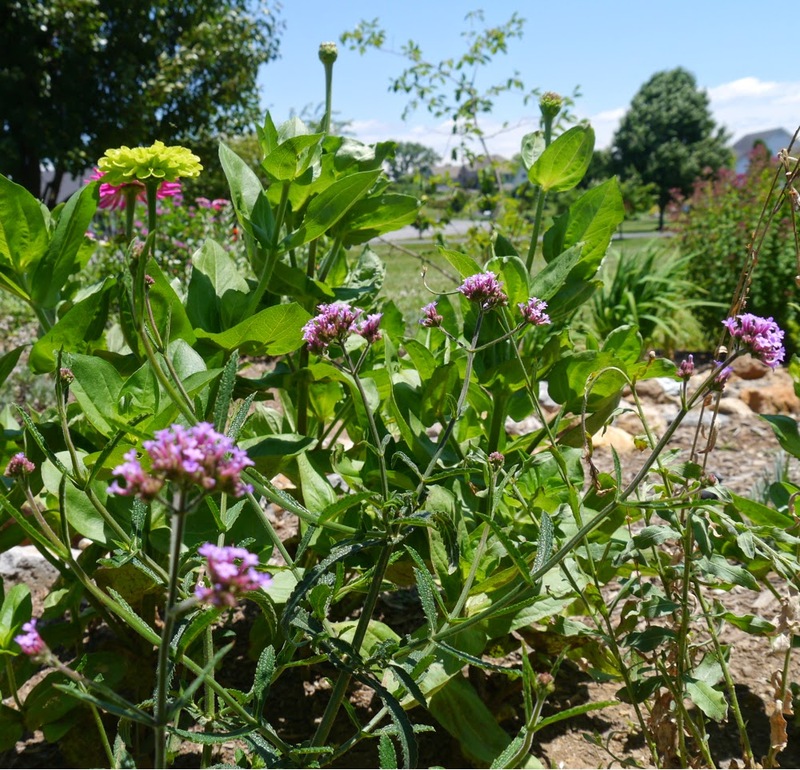 The photo above shows my cutting garden as it is today, and this is its very first summer. 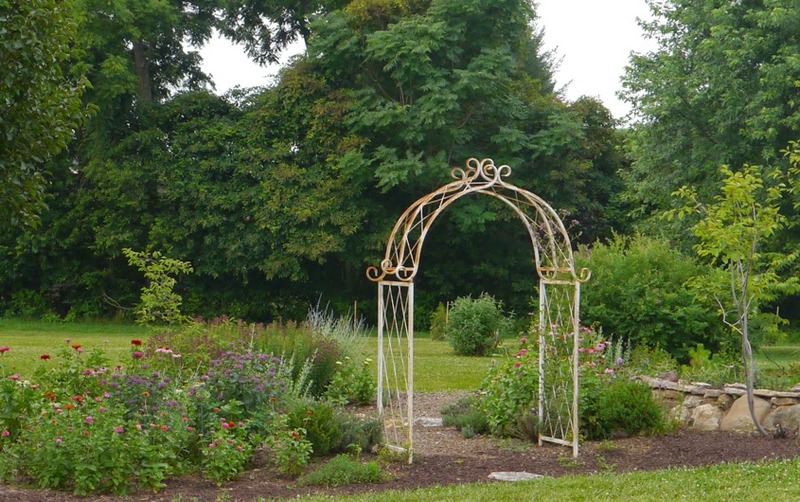 We prepared the bed last fall by tilling and adding a composted soil mix from a local supplier. 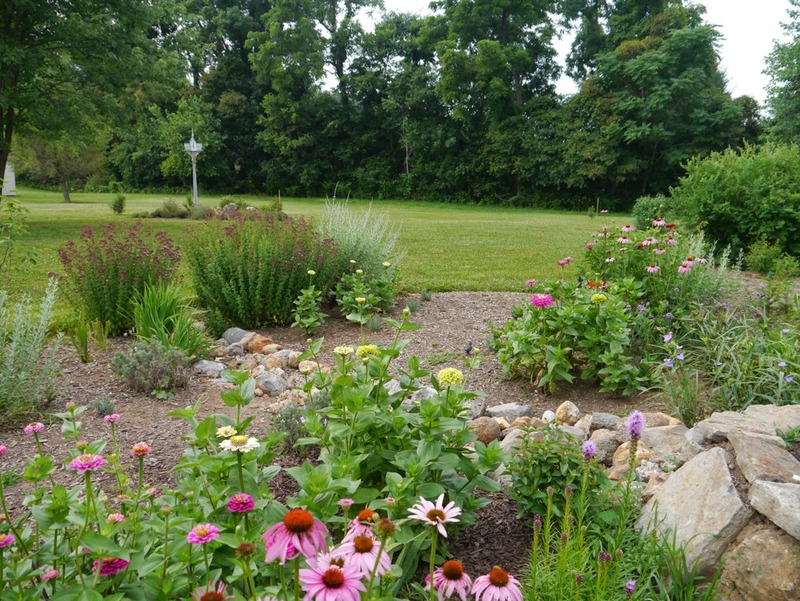 Our primary purpose for creating this garden initially was to address an issue with stormwater runoff from a nearby downspout. So this was a perfect spot for a rain garden (a huge subject for a future blog post) prompting us to create a dry creek bed. Future plans include constructing a small footbridge here. 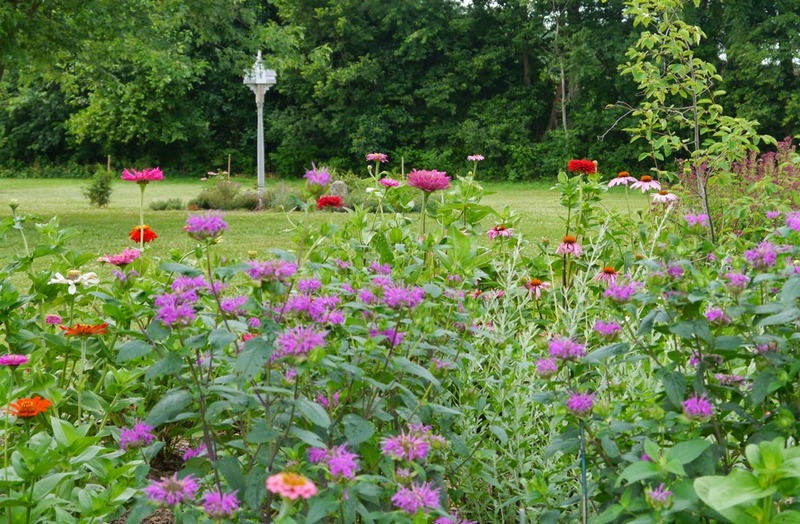 Then around about April or May this year I transplanted numerous amounts of existing perennials from areas in the backyard where the previous owners had planted them. 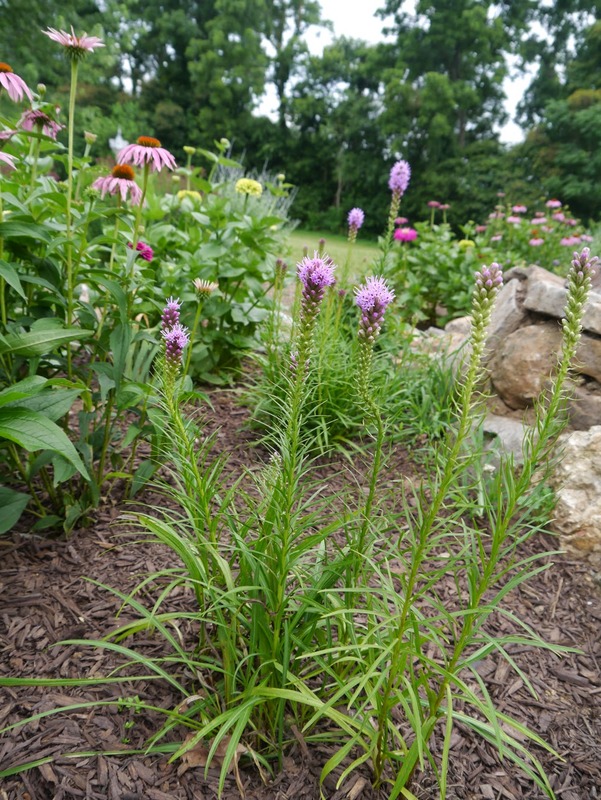 Just a few weeks ago I found some Liatris 'Kobold' popping up among a huge bed of yarrow and have transplanted it to my new cutting garden. Its so much fun gardening at a new home and finding these "little surprises". The previous owner left me a folder with all of the plant tags so that's how I know what all these perennials are. Above are a few other lovely "surprises" that I have growing elsewhere on my property, which are also great cutting flowers. Who knew Spirea would make such a great cut flower! They are actually drying in my vases and still look nearly as lovely as when they were freshly cut. 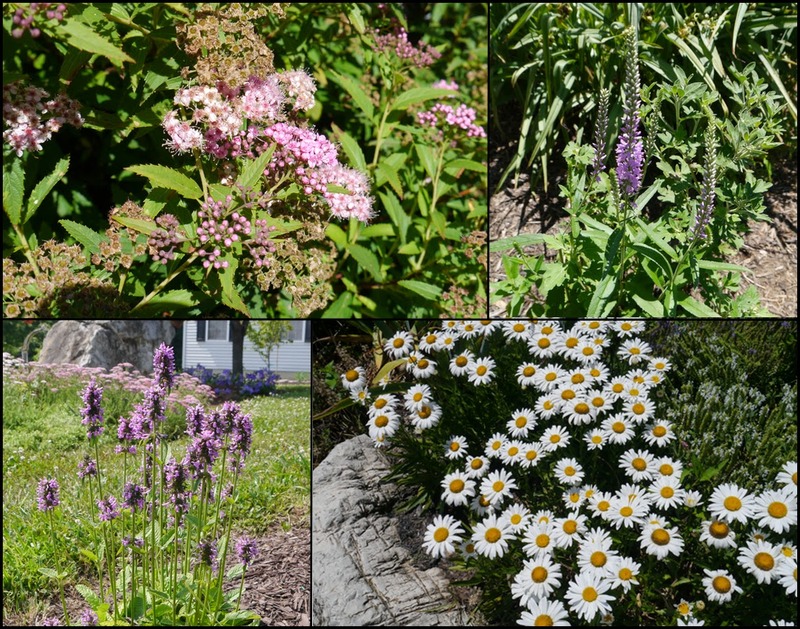 It's been wonderful to have so many existing perennials to divide and transplant from other areas in my yard, but I did purchase a few new things. 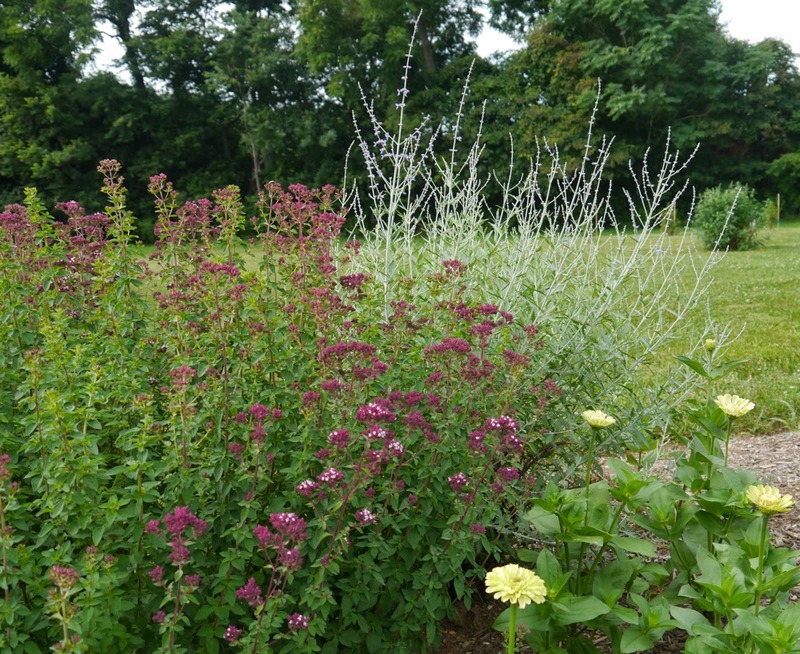 In addition to the Ornamental Oregano and Mexican Verbena shown above, I found a great buy on my favorite lavender - 'Fat Spike'. Future plans for my cutting garden include installing a natural stone pathway and my 'Fat Spike' lavender will make a lovely border. I've grown it before and I can attest to its hardy nature. I couldn't believe I found it at a nursery here, seems most of them only carry 'Hidcote' or 'Munstead', both of which I have growing elsewhere already and have nearly lived out their days. 'Fat Spike' is far superior, in my opinion. 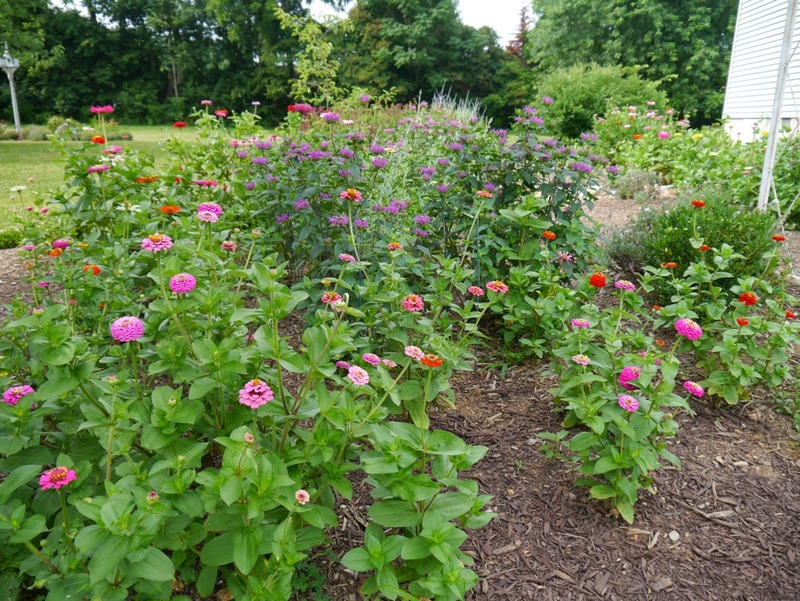 Then in early June I filled in the gaps around the perennials by seeding zinnias. I also seeded cosmos and Mexican verbena in late June but had no luck with germination on those, most likely because I failed to keep them moist. So....here we are...what the fuss is all about. I found that the Daisies and the Coneflower were the first to droop, but then I did nothing except change the water a few times. I know there are things you can to do to prolong the bloom, but I've never done any of them. cynthiacranespottery.etsy.com - More new creations coming in mid-late July! 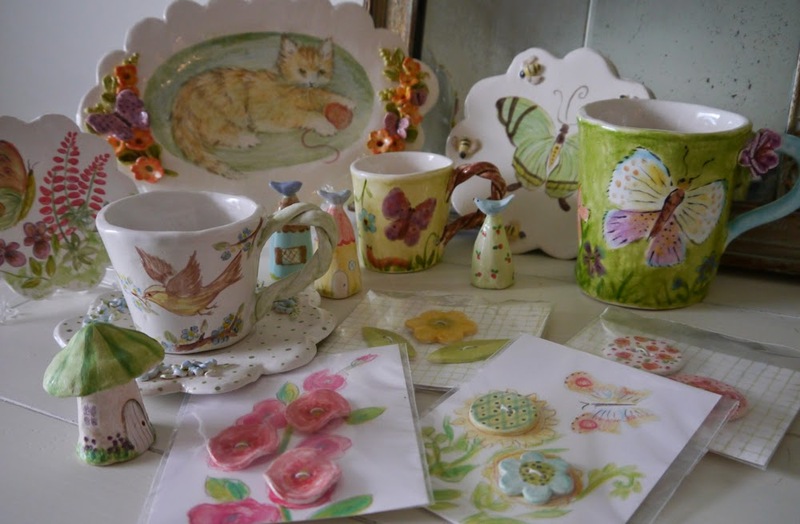 And it surely comes as no surprise that the lovely colors, and the birds, the bees and the butterflies in my new cutting garden, all come together to inspire my porcelain ceramic art! 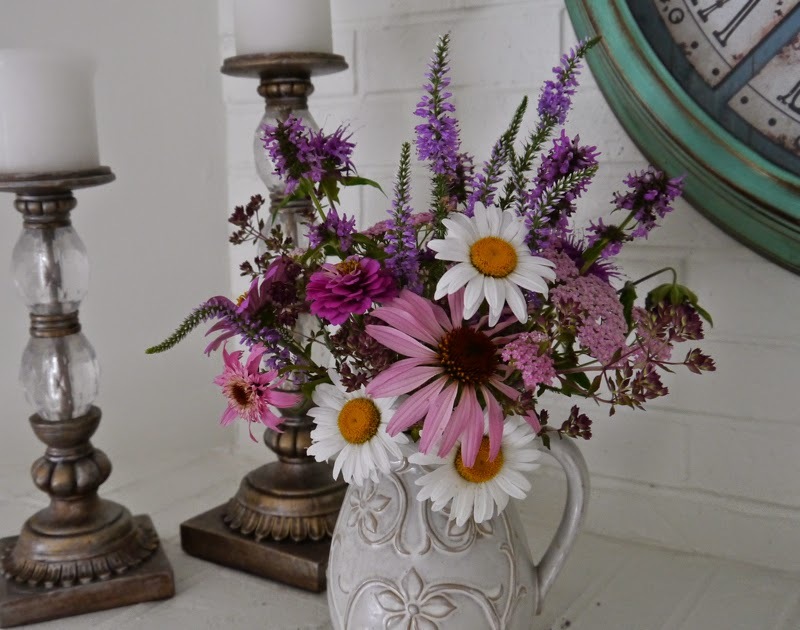 I would love to know your favorite cutting garden flowers, be they annual or perennial. 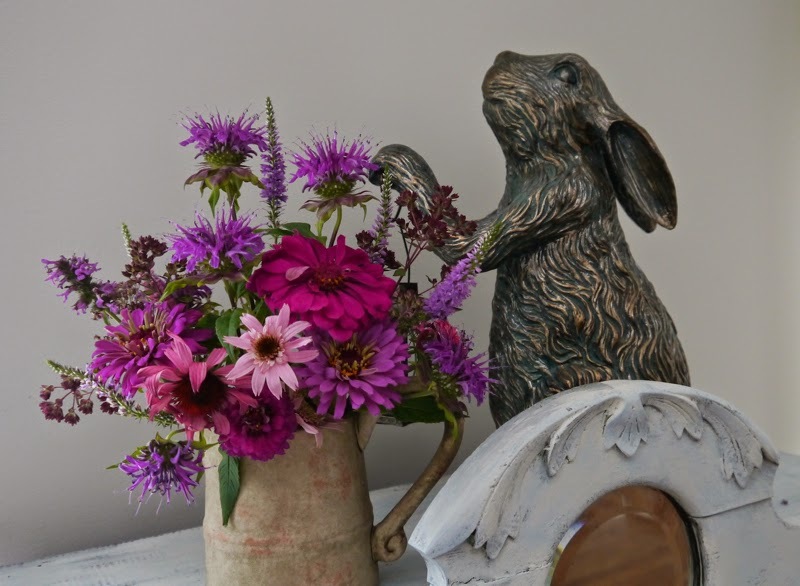 So please do comment and let me know your thoughts as well as how you keep your blooms lasting in the vase. Feel free to include your own blog address in your comment, too! Note on commenting: Many of you will be pleased to see that I have removed the Disqus comment gadget from my Blog. Hopefully you will find commenting here a much better experience now! 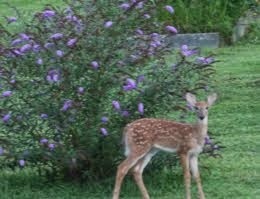 Your gardens are beautiful and I can just smell your pretty bouquet! It took me a couple of years to finally cut my flowers and bring them inside. Silly for being a gardener. Thanks for stopping to visit me. Oh, Donna I know exactly what you mean about cutting your flowers! I'm like that, too, or I used to be. The thing is, now I have so many and my cutting garden is my first. 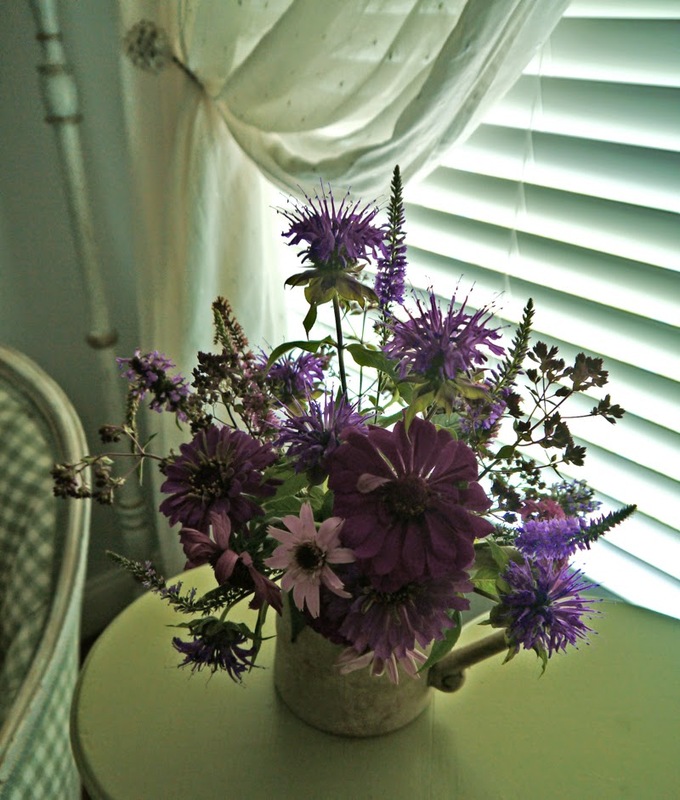 I do still hesitate cutting certain blooms and I mostly cut the ones that are hidden anyway. 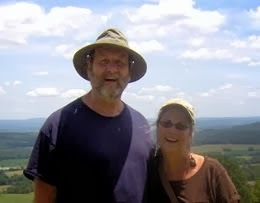 Thanks so much for returning my visit to your blog! 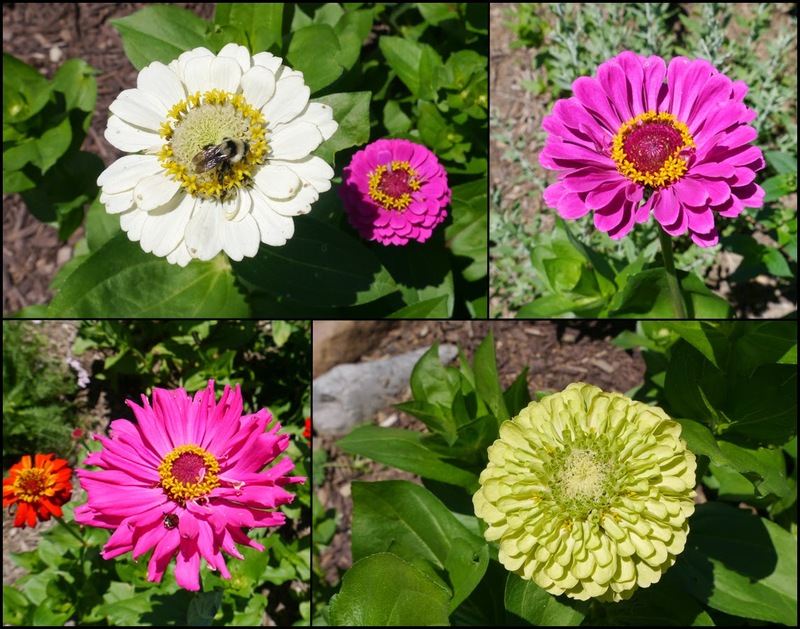 Your zinnias are so pretty and prolific :) That lime green is electric. Although the dead, dry stalks might not be very attractive, would they reseed if left alone through the fall? Daylillies are some of my favorite perennials even though the foliage sometimes turns yellow. I have mostly orange from the previous owner of my home, but they are a double bloom so that's new for me. And the ones I've planted are pretty awesome purple, red, a bourbon burgundy color and one really nice yellow lily with a purple face. 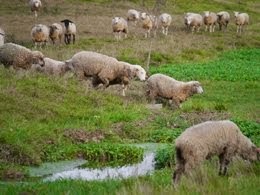 They spread like crazy though, so probably not the best for cultured beds. 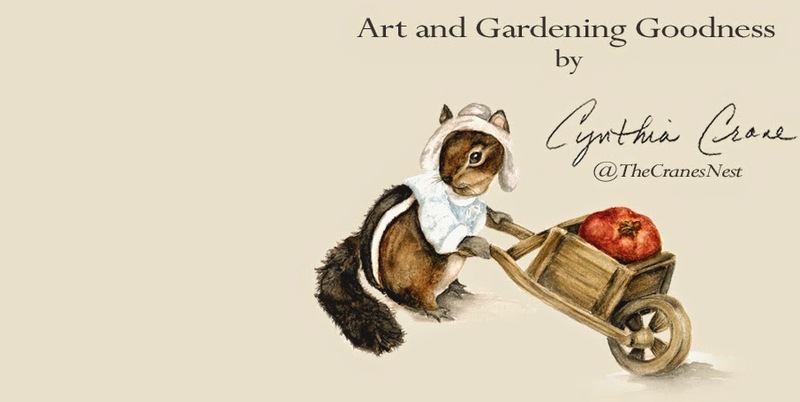 Beautiful gardens, Cynthia! No wonder you'd rather be gardening! Wow, Cynthia your flowers are beautiful! I love your purple bouquets. I love your arbor and your bench too. 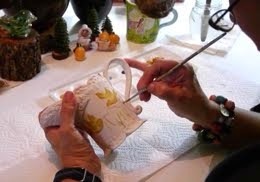 Your ceramic pieces are oh so sweet. What a beautiful garden you have I am missing my california garden and hope to plant some flowers for cutting very soon, just getting the site prepped now. I just cut back my garden that surrounds the cottage from 24" to 18" wide to get ready for the new walkway & patio installation. Most of the plants (which I transplanted to a new garden area) are native. I also planted delphinium, roses, foxglove, lavender (munstead because that is the only lavender that will grow here), coneflowers, & salvia. Every year, I try adding something new - and wait until the next to see if it has survived the elevation/winters. Peonies are my favorite as are sunflowers, iris, Queen Anne's lace and a bunch of others that aren't "quite" cutting garden flowers. Doesn't matter though, still love 'em! I truly adore milk weed because they bring the Monarch butterflies which are bliss. I love your pretty gardens! Just lovely! Your garden is beautiful! All those brilliant color and variety. I so want to be there! P.S. My mom and family loved the zucchini bread. It was so moist and delicious. I just finished my 8th piece! One batch made a small bundt cake and wide loaf! Yummy! Thank you EVERYONE for all your lovely comments (and complements!) 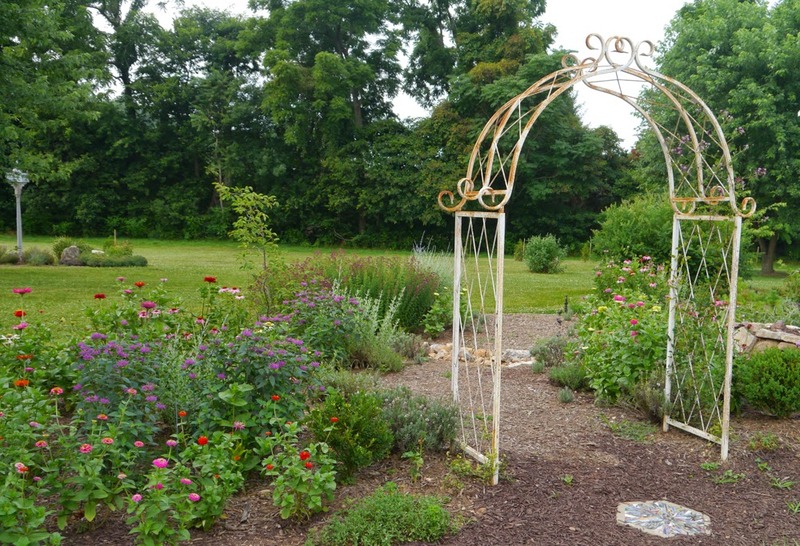 My cutting garden is lovelier now - here in my area we had temp in the 70's last week and lots and lots of rain. I'll have to post follow up pics. But don't miss my newest post - launched today - and get my free downloadable recipe card art! 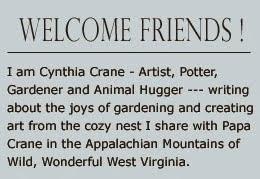 Hi Cynthia, Thought I should take a look at your blog and see this passion for gardening you talked about on mine. You have a BEAUTIFUL garden. So many flowers and beautiful places to enjoy. You ceramics reflect your love of gardening. The sweet little ceramic veggies are wonderful. Very pretty! I love all of your little pottery cups! You make me want to rush out and buy some seeds! What gorgeousness! Your flower arrangements are beautiful! As is your amazing pottery pieces!